It's time to get the band back together. But they're going to need a lot to make a reunion happen, like the right clothes, the right gear (including a wah-wah pedal), a sweet VW bus to drive to gigs in, and of course, a time machine. Because the 60s ended a long time ago. But there's one thing they need most of all, and luckily it's one you can help them with: a groovy frontwoman and lead singer, one with the pipes and the type of far-out style that can rocket right to the top of the charts. All you need to do is don this sweet 60's Babe Wig! However you decide to use it, it's perfect for a night of retro Halloween fun. 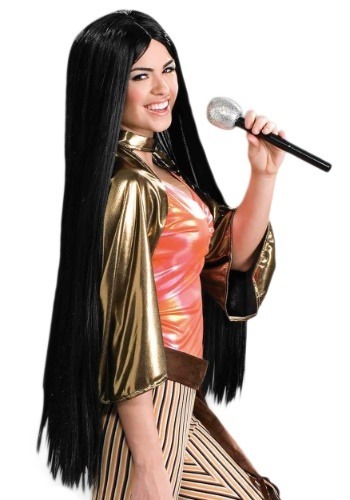 With long, long black strands, it captures that classic Cher look from the "I Got You Babe" era. Along with any of our wide variety of 60s and 70s accessories and costumes, this 60's Babe Wig makes for one truly out-of-sight costume!